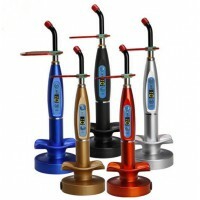 Dental curing light is used for the polymerization of light-cured resin-based materials. In the contemporary world of dentistry, curing lights have become an integral part of all specialties and dental practices. Today, almost all resin composites, dental adhesives and adhesive cements utilize light energy for complete polymerization, which further determines the long-term clinical success of a procedure. While much attention has been given to the details of diagnosis, preparation and the development of improved adhesives and resins, light curing is often taken for granted. It’s a well-accepted fact that inadequate polymerization of the materials can lead to clinical failures, such as sensitivity, marginal discoloration, fractured restorations and de-bonding issues, making it critical to select an ideal curing light. Curing lights allow us to initiate the polymerization reaction “on demand” for a vast array of materials. However, there is, perhaps, more misinformation and hype regarding this type of dentist equipment compared to just about anything else we use on a daily basis. Most of these controversies center on how long you have to cure specific types of restorations as well as how deep you can cure specific types of materials. Both light intensity – or irradiance – and the dental application should factor into a dentist’s decision regarding his or her choice of curing light. For instance, irradiance is measured by calculating power output, or milliwatts (mW), of a curing light across the surface area of the curing light guide. A curing light must deliver a minimum irradiance of 400mW/cm2 for a time interval to adequately polymerize a 1.5-2mm thick resin composite. Clinicians also should consider the clinical application at hand. It has been documented that irradiance of curing lights attenuate/decrease significantly when it passes through restorative materials, such as ceramic restorations or resin composites. The percentage of decrease in irradiance depends on filler type, filler loading, shades, refractive index, opacity, translucency and thickness of restorative materials. Curing lights with high irradiance compensate for the decrease in the loss of total energy and allow dentists to cure resin composites completely. In general, an irradiance of 1000mW/cm2 or higher is considered ideal to cure resin-based materials through indirect restorations.